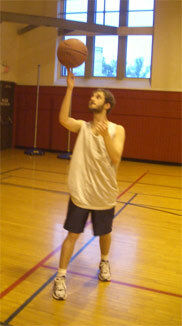 I am Zach Feinstein and I have declared for the 2008 NBA Draft. Also, I am a Senior at Washington University in St. Louis double majoring in Systems Engineering and Applied Mathematics. I work with Intramural Sports at Wash U as their webmaster, I have also run the annual Intramural Sports Trivia Bowl for the past 2 years. I currently work in 2 different research labs on campus and spent last summer doing research in China, so sadly I was not able to be present at the draft at Madison Square Garden on June 26. Furthermore, I do not play basketball.